I don't know that I have a whole lot to say about the latest issue of the Mineshaft, its 30th and 15th anniversary special. I'm not all the way certain I ever did. I am so grateful for the undergrounds-and-those-that-followed-most-closely publication and its homemade, aggressively old-school aesthetic that I'd likely forgive it everything. It's also one of those hard-to-review works in that its audience and participants are invested in a way that's not typical for a lot of similar efforts. That asserted tone of either being on board or not is how it most resembles modern comics. Robert Crumb is represented with front and back covers, a dream diary, a stand-alone sketchbook page and a series of sketchbook comics selected by contributing editor Christoph Mueller. They're all entertaining, although I'm not sure I'd even bother to read the diary material were they stand-alone work from an unknown. I'm a fan of the artist William Crook's drawings, and writing about those drawings; there's a love cityscape of Chicago from Halsted that's as grand a summary statement for Windy City affection as I've seen. I didn't understand the (in some cases vaguely) political cartoons from Mary Fleener, whose work I tend to like very much; heck, I like Mary. That kind of presentation doesn't seem to fit her strengths, although maybe that's due to the cartoon selected -- the two more broadly cultural/political ones seemed more effective than the more strident, directly political ones. I also appreciated a sample of a longer work by Elizabeth Koenig, although it's hard to ascertain its quality based on the few pages offered up. My favorite were the Zippy comics, autobiographical and wistful all. When that work hits it hits as hard as that done by any of Griffith's peers. 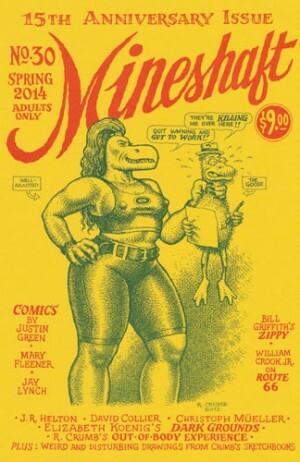 Crumb makes Mineshaft a must-buy; the flourishes from the artists contributing work in the same style, almost according to the same set of values, allow the publication to cohere in a way that distinguish it from other publications out there. Even on a standard issue like this one, I can't shake that sense of gratitude.